The butterflies, dear readers, are born! Here’s their first photo shoot. 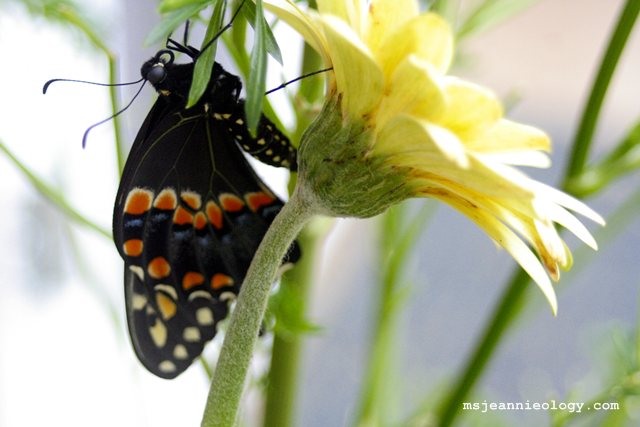 Each butterfly emerged on a different day so Ms. Jeannie named them appropriately. Wednesday was the one, if you recall, who chose to cocoon underneath the flower petals of the gerber daisy. A most pretty spot. 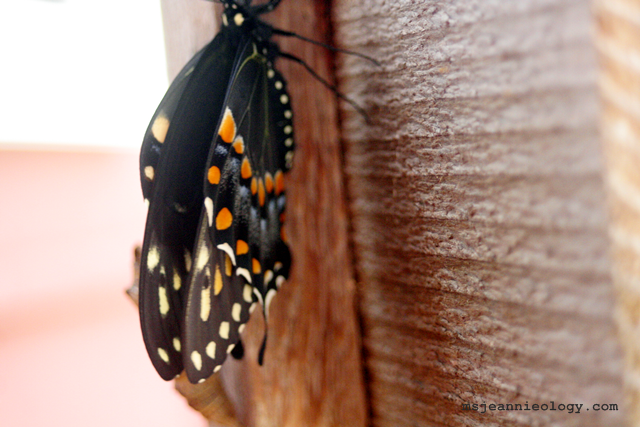 Here she was stepping out of the cocoon. Ms. Jeannie just missed her actual emergence by sheer minutes. 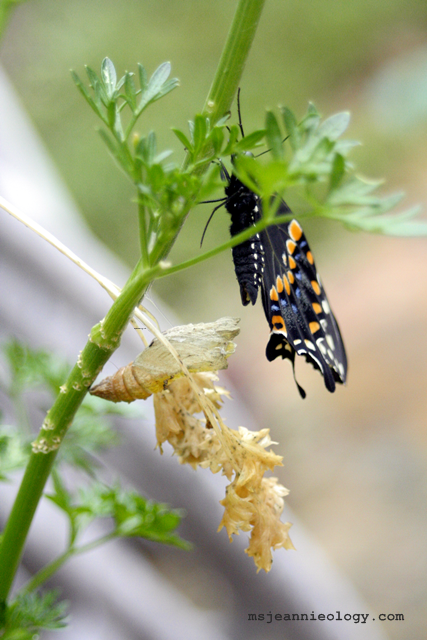 She had just checked on all three of the cocoons (status quo) and had gone around the corner to cut some herbs for dinner. 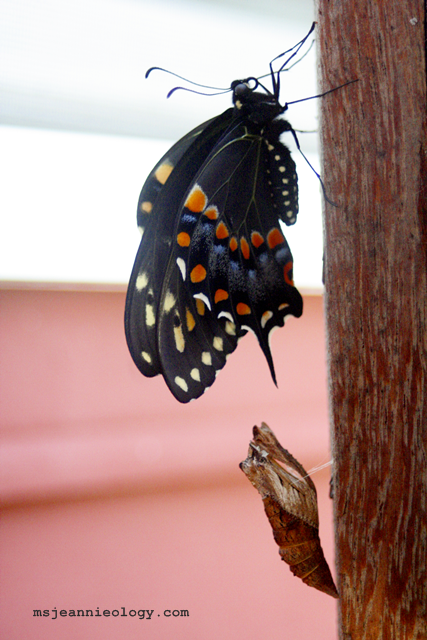 Five minutes later – here was Wednesday fanning out her new wings. 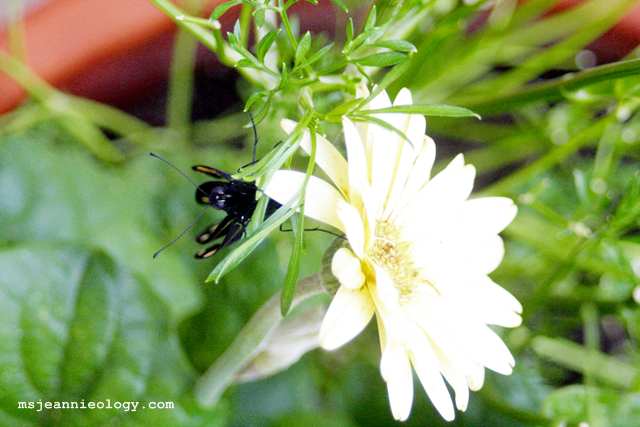 It was a slow-going little journey up the stalk of the flower while she figured out her legs and the tricky business of holding on. But by the time Ms. Jeannie took this aerial view, Wednesday was an expert! Because Ms. Jeannie had missed the actual moment of Wednesday unzipping the cocoon doors, she was determined to at least catch Wednesday’s first moment of flight on camera. She didn’t how long this would take. So she waited. And she waited. 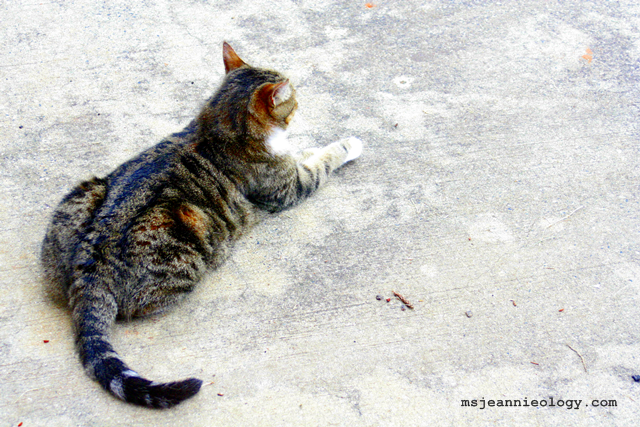 Ms. Jeannie’s cat, Satchem (incidentally named after a butterfly, herself) even waited with her for awhile. 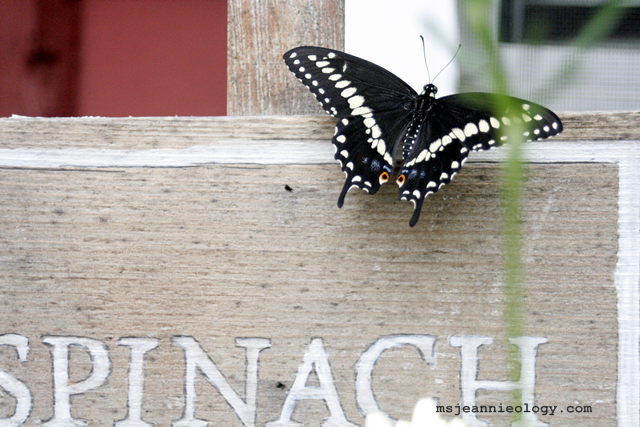 This gave Ms. Jeannie some time to explain to Satchem that there would indeed be no butterfly dinners in her future. She seemed to understand. Eventually though, she lost interest in the butterflies altogether and fell asleep underneath the tulip tree. 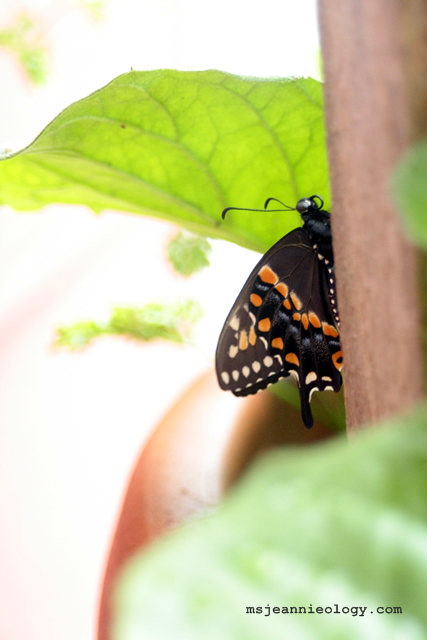 Meanwhile, Wednesday just stayed in her same spot, fanning those wings and taking in her new surroundings. After 25 minutes of waiting, Ms. Jeannie got side-tracked and went on to other projects – but she came back to check every few minutes. Going into the second hour, Ms. Jeannie came out to check and there was Wednesday on her petal and then in a flash of a second, there she wasn’t. 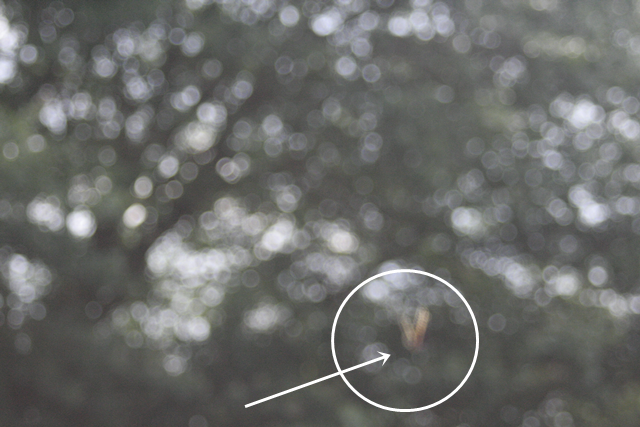 You can just make out the fuzzy swatches of orange as Wednesday flapped her wings. So long pretty girl! Like Wednesday, Thursday also chose the afternoon hours to emerge – although this little butterfly decided to come out just as the storm clouds started to rumble. The wind picked up considerably, and Ms. Jeannie feared that Thursday would get blown away before he had any sort of chance to get his bearings. But Thursday knew what he was doing. 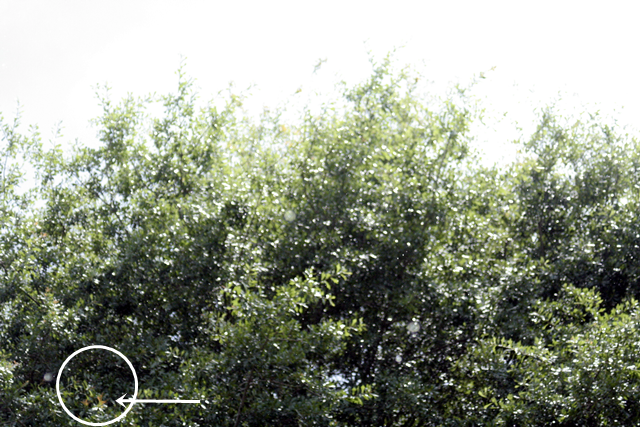 He was being blown about quite a bit – but he para-sailed through the high winds like a champ. Apparently, those stickly little legs are a lot stronger than they look! Then the rains came – torrential downpours so heavy Ms. Jeannie considered clipping the stalk he was on and bringing it onto the screened porch just to give him a chance to get his act together. But again, Thursday, adapted. 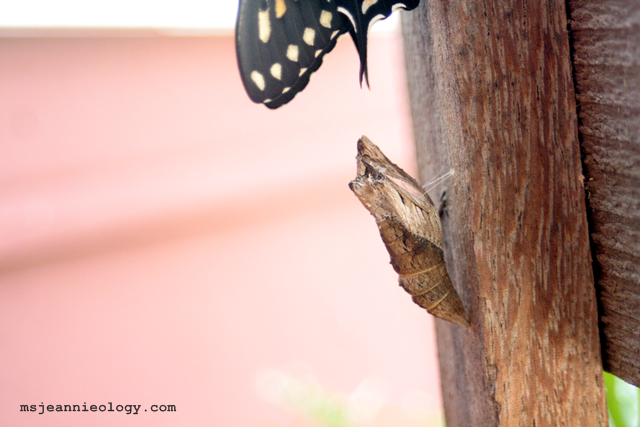 Although this time, he crawled back down to his cocoon and hung onto both the casing and the stalk for extra support. Only a slight improvement was Wednesday’s photograph! The next day it was back to full hot Georgia sunshine and Friday decided that this was his day to join his pals. 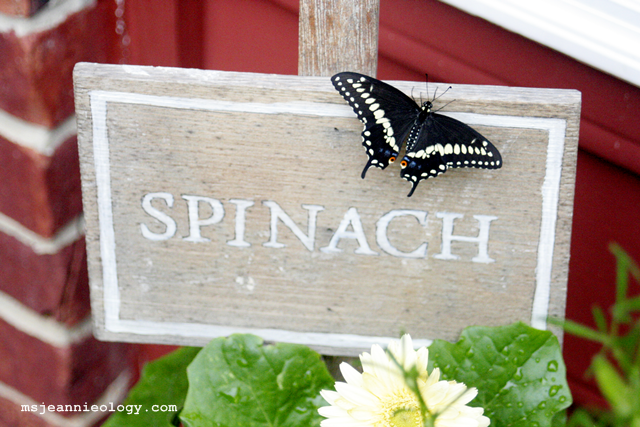 Friday was the one who chose to cocoon behind the wooden spinach sign – in what Ms. Jeannie thought was the most disguised location of the group. 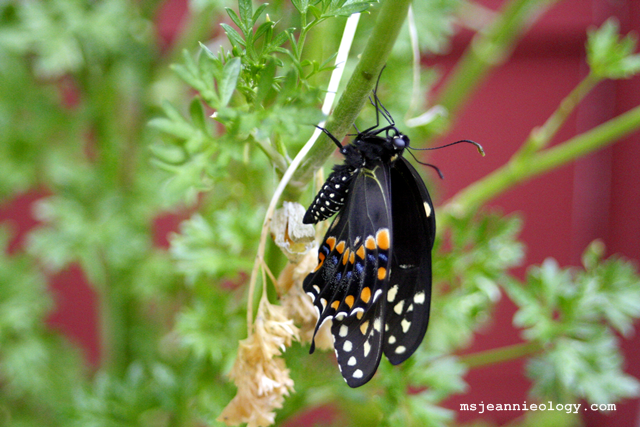 Ms. Jeannie was most curious about this one’s color pattern since he had a different color cocoon than the others. But he turned out just the same! So long cocoon, Friday’s on a mission! All the way to the top of the sign, he climbed. And then do you know what he did? So handsome and so perfectly balanced, he almost looked fake. Like someone had positioned him there on purpose! And then, just like the others he was there one minute and off exploring the world the next. 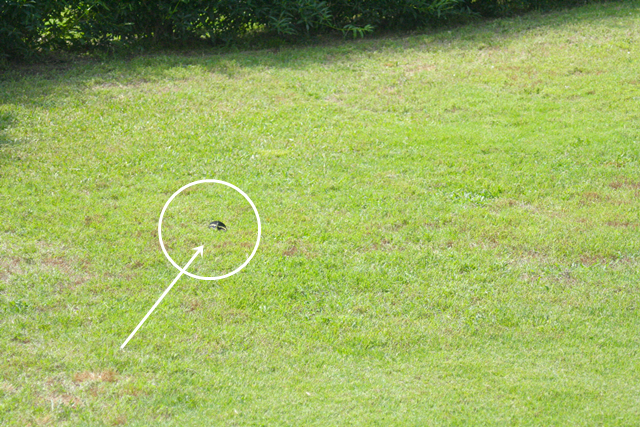 This time, Ms. Jeannie was sort of ready – but boy is it hard to capture these little fellas when they are flying! 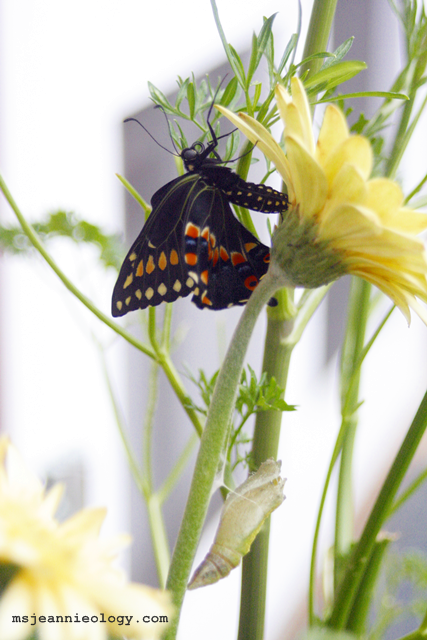 So there it is – the tale of the three black swallowtails. 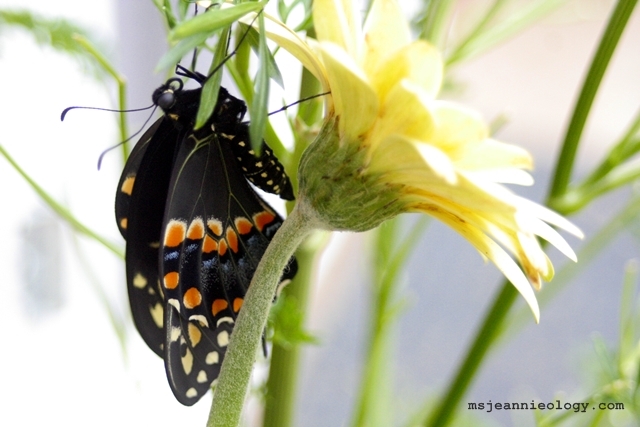 Most likely, Wednesday, Thursday and Friday will stay close to the garden enjoying a bevy of summer flowers before finding their own loves and making more swallowtail babies. Ms. Jeannie hasn’t seen them since their birthdays – but she feels like they could be close by. 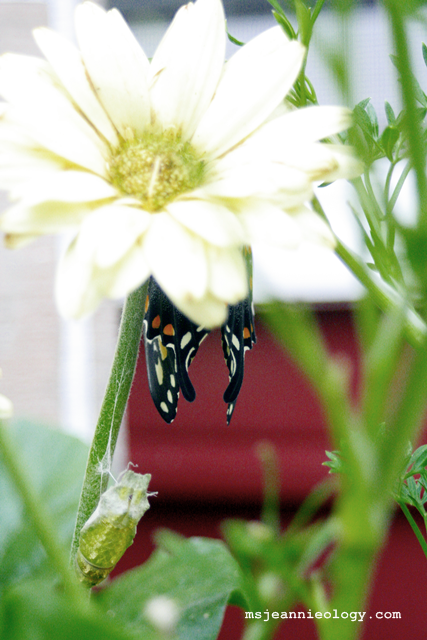 Of course, if she sees any fluttering about the garden, she will photo them for you to see too. Hopefully by that time, she’ll have improved upon those flight photos! Watching these little guys grow was a completely amazing experience for Ms. Jeannie, packed to the brim with hope and wonder. 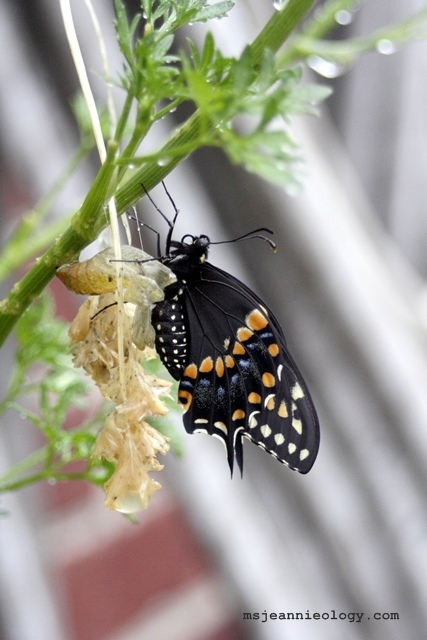 If you missed the previous posts, read about the beginnings of the butterflies (as caterpillars) here and (cocoons) here. Delightful, msjeannieology! 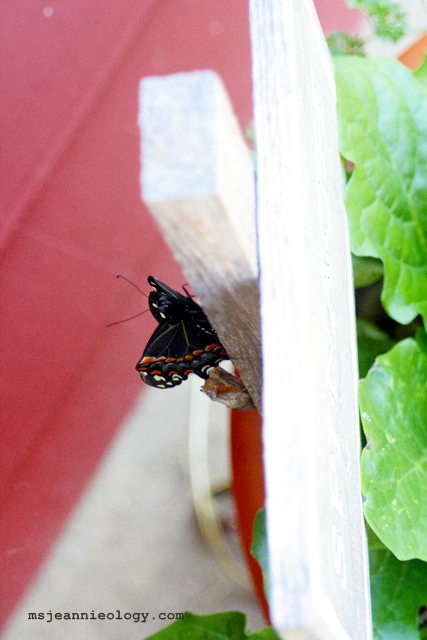 Butterfly photography is more of challenge than I knew! Hi Ms. Jeannie…It was definitely worth the wait! Oh thank you my dear! They were a striking trio! Clapping with excitement…what a wonderful photo journey of the butterflies! I particularly like Fridays dramatic pose at the top of the spinach sign. He certainly was the most accommodating of the three! Oh agreed Elizabeth! He was definitely the camera ham of the group! Thank you for sharing their wonderful journey, I have been looking forward to this post. What beautiful creatures, I do hope they pop back to visit you soon! Lovely ending to the circle of life…..just beautiful!